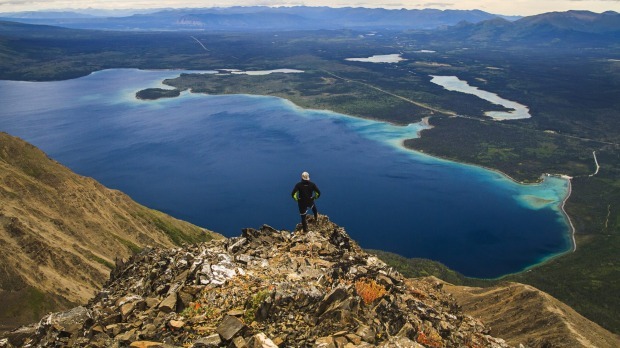 You don't have to be intrepid to enjoy the mountains and lakes of The Yukon, writes Julie Miller. The best laid plans of mice and men often go awry, as Scottish bard Robert Burns famously warned. And all it takes is one little fall from a horse, and one resulting broken leg, to spoil my grand scheme of taking on Canada's Yukon River in a canoe. Rivers and moonboots aren't a great combination – so it's on to Plan B, which I'm calling Yukon Lite. Instead of experiencing this famed adventure destination like the superwoman I clearly failed to be, I'll be approaching it in a manner more befitting my age (ahem!) and current physical prowess – that is, through the window of a mini-van, occasionally hobbling to a viewpoint for a photo opportunity. It's certainly not ideal – and as I wave goodbye to the intrepid paddlers I was supposed to be joining, I can't help but feel I've been dealt a cruel blow. Sure, I'll have a warm bed rather than a cold tent pitched on a riverbank, restaurant meals instead of baked beans, and my shoulders and back won't ache a bit – but wahhhhhh! I wanna go with them. Not fair! Wiping away a tear, I hop (literally) into a van and begin my own passive tour of southern Yukon's beauty spots. With the capital of Whitehorse as my base, I'll explore different scenic routes over three days, returning to the comforts of the city each night. Whitehorse is often derided as a utilitarian, rather plain town, a mere gateway to the unfettered wilderness of Canada's north. Within 10 minutes of the city centre, however, nature rears her gorgeous head, with views of snow-capped peaks, spectacular chasms, unfenced forests and meadows strewn with magenta fireweed and dandelions, favourite snacks for ravenous black bears. My first excursion takes me south towards British Columbia, where a chain of alpine waterways called the Southern Lakes form the headwaters of the mighty Yukon River. This region holds a special place in the history of the territory: during the gold rush of 1896-99, it became a transportation centre, paddle-steamers, rafts and canoes ferrying goods and gold-diggers north to the Klondike on their arduous quest for fortune. Even on a mild summer's day, the wind whipping these glacial lakes cuts to the bone, and it's sobering to consider that most Stampeders made their dash north in the frigid depth of winter. Little wonder so many chose to settle in this comparatively balmy region, setting up businesses and services including schools, restaurants and hotels that doubled as brothels – most famously The Arctic on Lake Bennett, owned by one Fred Trump (yes, that Trump's grandfather). Today, the lakes are used for more conventional recreational purposes; in summer they lure fishermen, kayakers and hikers to their pretty shores, while in winter dog sled teams and ice skaters skim across their frozen surfaces. Snaffling prime position on Tagish Lake is Southern Lakes Resort, which offers cosy log cabin accommodation as well as a popular waterfront restaurant, well worth the detour for its Swiss-inspired seasonal creations served with mesmerising views. 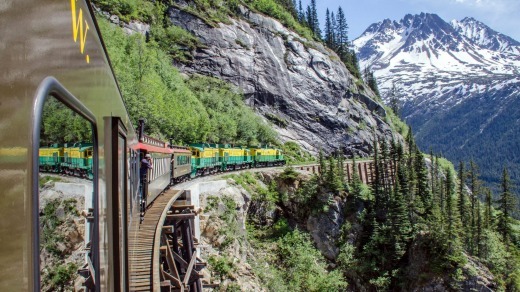 Arguably the most popular day trip from Whitehorse is the scenic rail journey on the historic White Pass and Yukon Route Railway, a narrow gauge railroad built during the gold rush to transport prospectors from the port of Skagway in Alaska to Whitehorse. Today, only the southern section of track is in working order; so my tour begins with a coach ride to Fraser in British Columbia, where we board restored vintage railway carriages for the final 44.5-kilometre stretch through the mountains to Skagway. To call this railroad an engineering feat is no exaggeration, with the tracks – constructed over 26 months by tens of thousands of men – climbing more than 900 metres in just 32 kilometres, clinging to mountain ridges and straddling gorges on don't-look-down bridges and wooden trestles. Try to nab a window seat on this journey; the views will send your camera into overdrive, with snow-capped peaks, glaciers, forests and cascades providing a dramatic backdrop. Step outside onto the observation deck for less restricted vistas and a blast of fresh Alaskan air; then scurry back inside to huddle around gas heaters with a warming cup of tea. Crossing the US border at White Pass Summit (don't forget your passport), the train begins its descent towards the sea, passing the original Trail of '98 and other relics of the gold rush, including cemeteries and the bleakly-named Dead Horse Gulch, where 3000 over-burdened pack animals met a tragic end after failing to handle the difficult terrain. 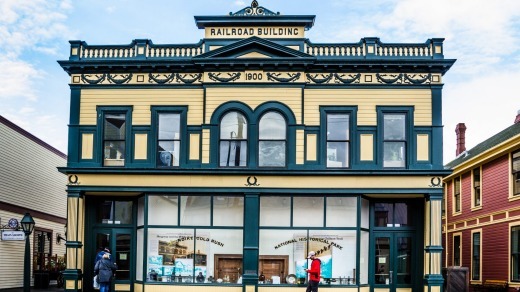 Skagway itself is an adorable historic town. So impeccably restored, it looks like a Disneyland streetscape. Unfortunately, there's a cruise ship in port, and the streets and shops are chock-a-block with passengers seemingly as mobility-challenged as me – no judgment, mind, but progress is somewhat slow along the boardwalks. My final day trip, however, takes me far from the madding crowd into the heart of the Yukon wilderness. Straddling the Alaskan border and forming part of the largest internationally protected tract in the world, Kluane National Park is a landscape of superlatives, home to Canada's highest peaks and largest icefields, where more than 2000 glaciers continue to carve a path through remote, snow-covered ranges. 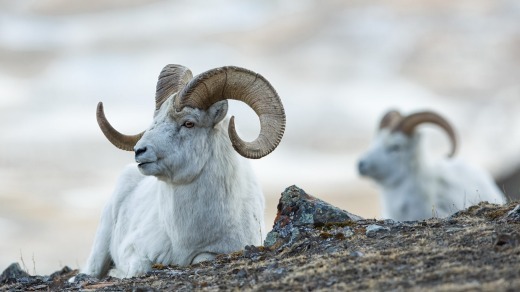 Dotted with lakes and challenging trails, such as the five-kilometre ascent to King's Throne amphitheatre (a mere "day hike" in the Yukon lexicon) or the multi-day loop through the breathtaking, grizzly-infested Cottonwood Trail, Kluane is an adventurer's wonderland, crying out for active exploration on two good legs. But my moonboot and I are taking the easy way out, getting a bird's eye view of the park's untouched interior on a flightseeing tour with Kluane Glacier Air Tours. Flying at an altitude of 10,000 feet – lower at times than the actual peaks – our pilot Ali follows the path of Kaskawulsh Glacier, looking uncannily like an ice highway on its march through time. Continuing in a loop, Ali swings left along South Arm Glacier, electric blue gashes punctuating the rippled white surface. In the distance, Mount Logan – Canada's highest mountain at 5959 metres – peeps ethereally through the clouds; while other monstrous massifs seem close enough to touch as our Cessna skims past. This truly is a spectacular flight, breathtaking in its beauty, humbling in its grandeur and a fascinating snapshot of a landscape on the move. Now it's my turn to feel smug – this is an experience almost worth getting injured for, and something that will give me boasting rights when I next meet up with my canoeing buddies. Several Whitehorse companies run day trips to the Southern Lakes and Kluane National Park, including Who What Where Tours (whitehorsetours.com) and Nature Tours of Yukon (naturetoursyukon.com). A one hour flightseeing trip with Kluane Glacier Air Tours costs $CA250 a person (kgat.ca) and the White Pass & Yukon Route Railroad return trip costs $CA141 an adult (wpyr.com). Julie Miller was a guest of Tourism Yukon.